The circus is in town. But instead of lions jumping through flames and brightly-dressed clowns, “La Verita” will seek to portray the spirit and life of surreal artist Salvador Dali through a mixture of music, skits and acrobatics. 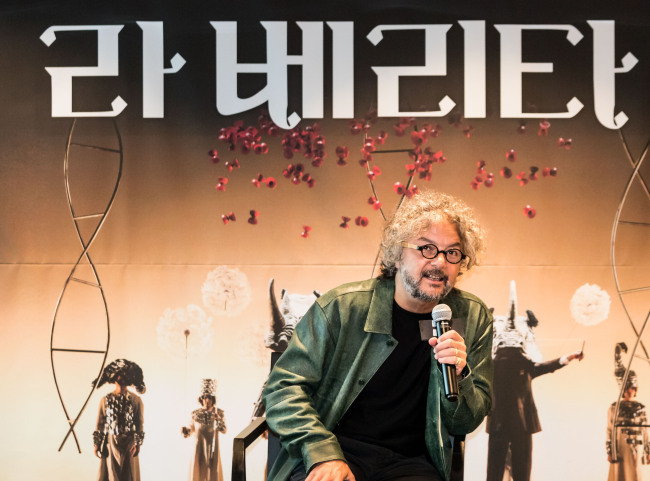 Daniele Finzi Pasca, who wrote and directed La Verita, said the “art circus” seeks to portray a surreal depiction of Dali’s life through circus. La Verita was inspired by “Tristan Fou (Mad Tristan),” painted by Dali in 1944 and depicting the legend of Tristan and Isolde. A replica of the surreal art work hangs in the background during the performance. “From a psychoanalysis point of view, I think the piece by Dali depicts his inner self by combining with a nightmare. We diluted the dark and gloomy atmosphere of the original and depicted in a dream-like state reminiscent of (painter Marc) Chagall’s style,” said Finzi Pasca during a press conference held Tuesday. “Tristan Fou” saw the light again in 2009 and was sold at an auction. The anonymous owner and Finzi Pasca agreed to make the work into a performance, after which the director sought a better understanding of Dali. Finzi Pasca said he visited the Spanish painter’s former home to find out how he lived, the books he read and how they affected his work. “Like collecting pebbles, I put the pieces together one at a time,” he said. To the Swiss director, a circus represents more than just entertainment. Finzi Pasca said his work also represents the path toward the truth. “La Verita means the truth. The performance will be about what is truth and how can we find it. “Truth accompanies a sense of peculiarity. By depicting the nightmare in Dali’s paintings, I want to depict a peculiar path toward finding how its life really was. The theme is to depict the truth in a peculiar fashion,” he said. La Verita, by Compagnia Finzi Pasca, will be held at LG Arts Center from Thursday to Sunday. The show starts at 8 p.m. on Thursday and Friday, 7 p.m. on Friday, and 3 p.m. on Sunday. It is open to audience aged 7 or above, and tickets start at 40,000 won. For more information, call LG Arts Center at 02-2005-0114.